An office may be a serious place of work, but only the most grim and short-sighted of managers will seek to turn it into a place where nothing but hard toil and the bottom line matter. Such a result may be deemed professional or dedicated, but the reality is it will make for an unhappy and tense atmosphere in which a myopic focus on results and hard graft will dominate. Never will the term ‘daily grind’ be more applicable. The results may be seriously counterproductive. Very few people will want to work in a place where nobody can raise a laugh or relax for a second without someone clamping down on it. Rather than producing a dedicated workforce committed to producing results to the exclusion of everything else, it will simply make people want to leave. After all, people spend a very large proportion of their lives working. They don’t want the experience to be a miserable one. All that means making a place happy and enjoyable is a must. After all, the most productive staff are those who enjoy their job and feel motivated to work hard because its a good environment to be in. Making an office fun shouldn’t be too hard, but it is important to get the balance right. It will be just as bad a move to make the office a place that’s so fun-focused nobody gets much actual work done. A good way to make an office more fun is to decorate it. Add attractive pictures. Paint the walls with bright colours. Bring in flowers and add more colourful lighting. However, be careful how you do this. Be aware that flowers could trigger hayfever for some people. And, above all, avoid putting up any offensive material. Having a pet in the office, like a cat or dog, can also prove extremely popular. The cute colleague can do a lot to lighten the day when people might be feeling the tension of tight deadlines or heavy meetings, and will be welcomed by animal lovers. However, it is wise to check that the creature will not behave disruptively, and there are also animal allergies to consider. 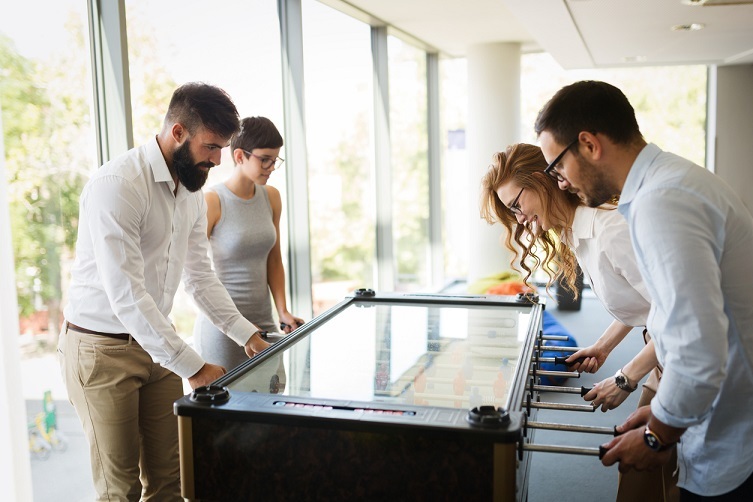 Playing games is another way to make an office more fun, but it can also be fraught with issues. For example, you may have a table football game that some people love playing, or an all-out war with nerf guns to get people in a better mood. However, these can easily get out of hand and become very noisy, with all that rattling, shouting as a goal is scored or non-combatants being struck by polystyrene projectiles. This is the point where someone’s fun can end up becoming a distraction or annoyance that reduces someone else’s output. Maybe consider restricting these activities to certain times in the day. The same goes when it comes to practical jokes and the playing of music. There is a line that should not be crossed in terms of the point where activities become highly offensive, damage property or are distracting – such as the music being too loud. None of that means that managers should adopt a killjoy attitude. But, just as a work night out should allow people to drink without isolating teetotallers, so it is that office staff ought to be encouraged to have fun, but only so far as it helps create a better working environment, rather than one of distraction and irritation.